A beautiful day, blue sky, unseasonably warm for the third weekend of October. Although the morning started in the low 50’s it was 70 plus and sunny for the game that started at noon. We had a brief tailgate before the game. The girls had CapriSun drinks and we had bottled water. It was a cold snack, strawberries and brownies. The walk to the stadium was interesting because this time we were on the side of the stadium that all the RV’s park. It was clear that there were folks that were serious about tailgating. This time we headed for our seats early. Since our seats were purchased with the Coke Pack Special we received a 32 oz Coke or lemonade, hot dog, and popcorn. Plenty to fill all of us up.Arkansas State 34, IU 36. The first half looked as though IU was going to add to their loss column. It teetered back and forth until the fourth quarter when IU finally up by 10 with a couple of minutes left. Here’s what the Herald-Times had to say about the game. 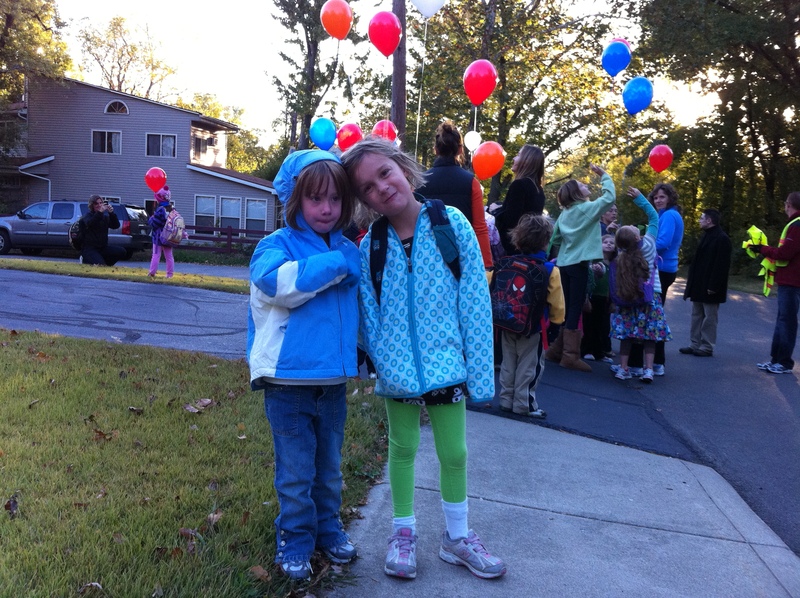 It was walk to school day. Sarah, Rachel and Ella arrived in time to meet the group and walk to school. They were not in time to get a balloon so I tried to teach them a sharing lesson. See how bad you feel when others don’t share with you. Next time you have something and someone else doesn’t, you should share what you have. It was clear no one got the point. I tried again after school and I may as well have been speaking another language. That sharing concept is tough for kids, actually for adults as well. An interesting list. I was happy dad made it to the list. It was missing on a comparable assignment during first grade. It was a surprise that butterflys made the list before mom. We walk to school everyday, so the special part was having a big group to go with. At noon on game day when it was raining, Justin and Jack were out and picked up some ponchos. Since we were prepared for rain, it stopped. While at the tailgate, Justin and Jack played challenged James Thomas and John Misz. We were as close as you can get, 21 to 20. There were long lines to get into the football stadium. 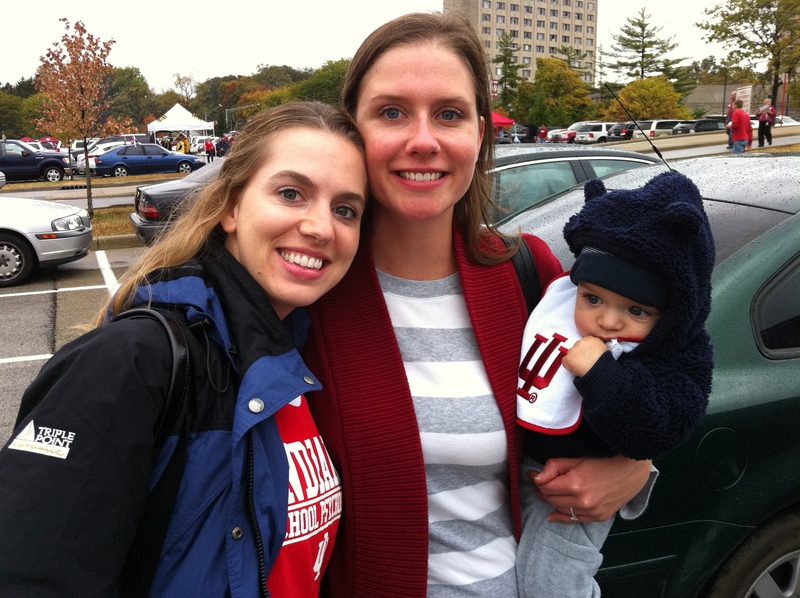 It was hard to believe that it was an IU football game with such a crowd. Another surprise was seeing the “sold out” sign on the ticket window. Since we were hung up in the line to get into the game it started without us. We were walking around the open south side of stadium when we saw IU draw first blood. 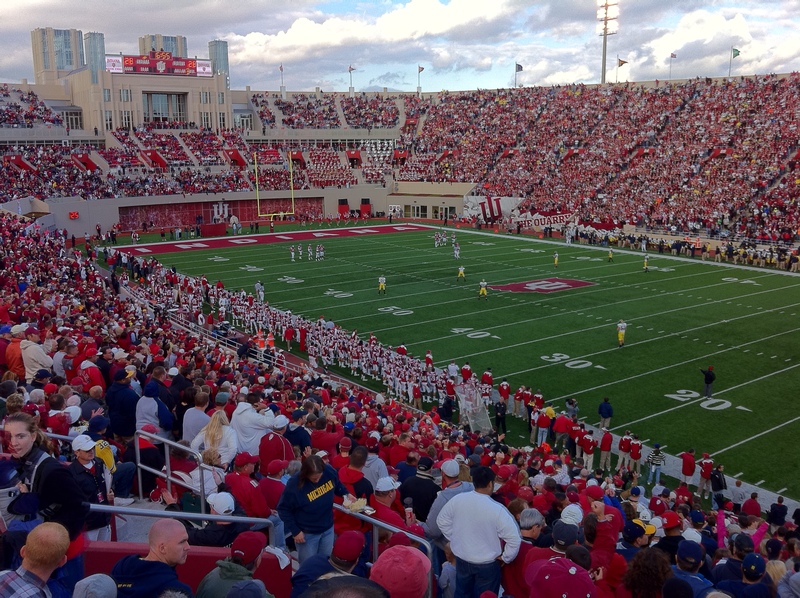 To have IU score first against #19 Michigan was almost as unbelievable as the sold out stadium. We arrived at our seats and then Michigan scored. It went back and forth trading touchdowns. A defensive display it was not. Both times marched up and down the field. It was 21 to 21 at half. Jack said the lady behind us, “imagine the people watching TV and see Michigan 21 – Indiana 21.” It was a nail biter. IU tied the score at 35 with only one minute left. Unfortunately it took less than a minute for Michigan to score and go ahead 42 to 35. With 20 seconds left, IU was unable to get another score. At least Justin was happy with the outcome. 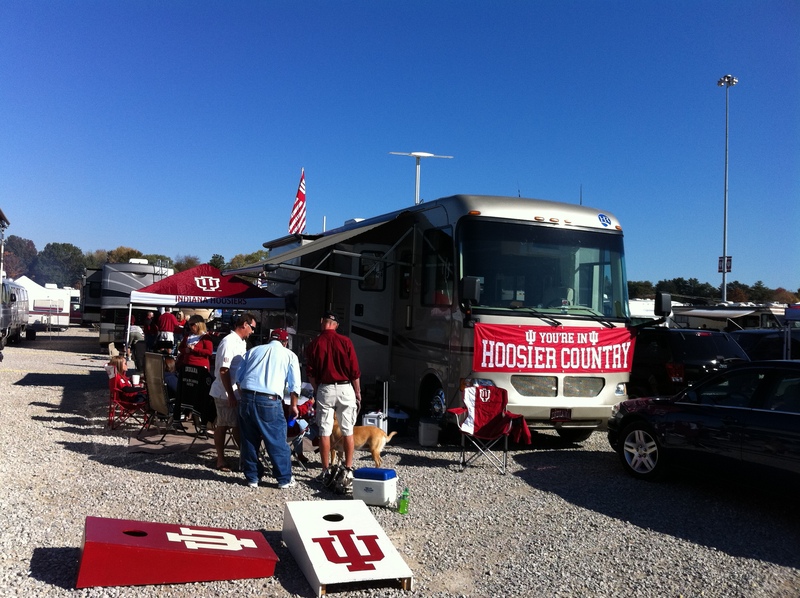 It sure deflated a lot of IU fans. So close, but a loss nevertheless. Another action packed weekend. 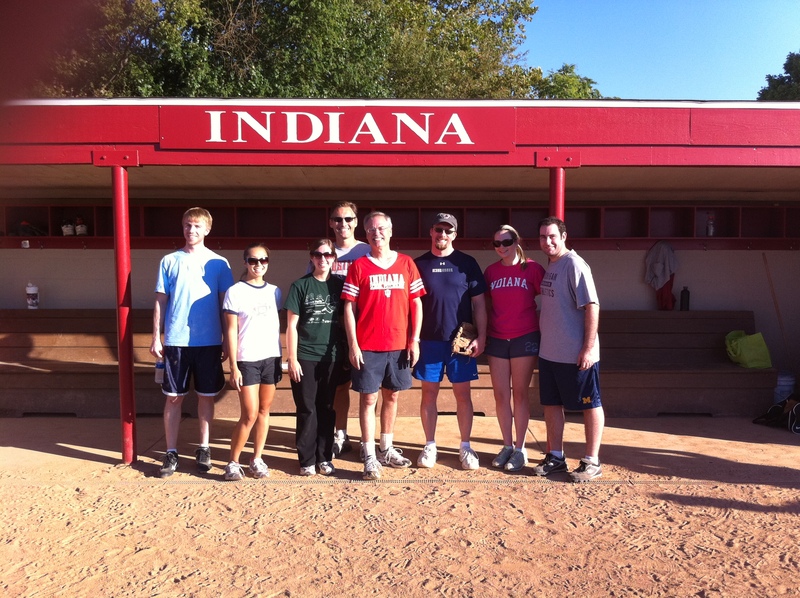 Friday night was the counseling/school psych softball game. Jack pitched for the school psych team. Unfortunately he gave up 17 runs. The good news was he caught 3 fly balls and picked up two grounders and threw the runners out at first. One of the balls should have gone to second, but an out is an out. For team school psych Scott Bellini contributed two homers, Jonathan Plucker hit another over the fence, and Jack was able to get on base when the throw to first was overthrown. Despite the 17 to 7 loss, we had a good time. Jennifer and Justin arrived with Jack on Saturday afternoon. 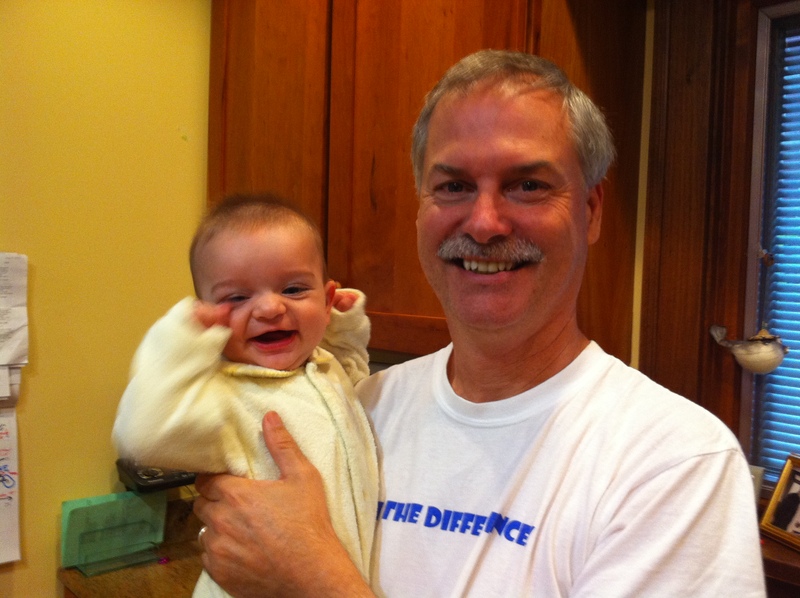 Jack looked every bit of six months. His hair was about a half inch long, very soft and somewhere between black and brown. His eyes are still blue. We’ll have to wait six months or so if they stay blue. Regardless, Jack has Jennifer’s big eyes. Big Jack couldn’t get over how often he smiled. What a great temperament. What fortunate parents. His downside is sleep. Jennifer and Justin would appreciate it if he would sleep longer at night. He is still up multiple times each night. Jennifer has turned out to be the best mom. Her willingness to sacrifice is impressive. 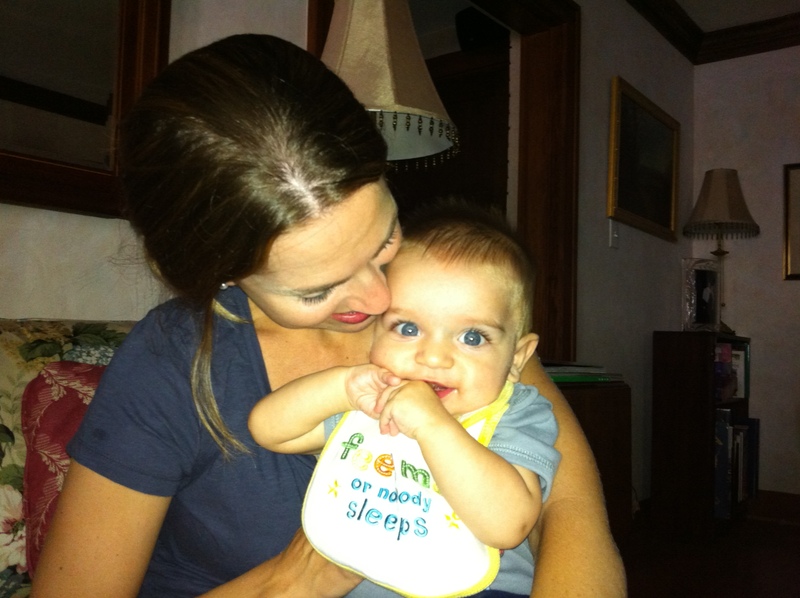 She is committed to breast feeding and has given up dairy due to Jack’s digestive difficulties. During pregnancy she developed diabetes and was willing to give up more than ten years of not eating meat. Fortunately she was able to continue the vegetarian diet. Justin, Jennifer and Jack went out to the Scenic View restaurant to meet her girl friends. Their dinner was marginal. Jennifer did not like that salsa on her dish and left hungry. Justin and I went out later to My Thai to get Jen some dinner. While they were at dinner, Marcia, Jack, and the three little guys went to the Inn at Brown County park. Jack wanted Marcia to hear the Dave Miller’s one man acoustic classic rock. The same guy that was such a pleasant surprise last Saturday night. He was just as good but a bit louder because instead of sitting to side of him we were directly in front. All and all a pleasant dinner with music and the girls. On Sunday Marcia took the three girls to Sunday school at Beth Shalom, and later headed up to Mooresville for a wedding shower. 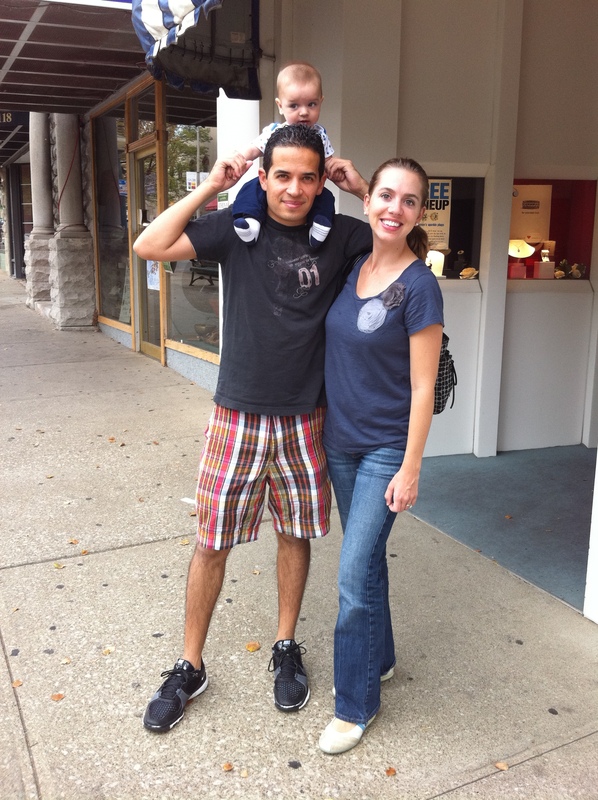 Jennifer, Justin, Little Jack and Big Jack had pleasant breakfast at the Uptown Cafe. Then it was back to 720 Ballantine so Jack and Jennifer could take a nap. Meanwhile, Justin and Jack headed to the HPER building to play table tennis. Justin had been playing during lunch and after 5 at work. He also has been learning some of the finer points of playing at some Chicago table tennis clubs. Needless to say, Jack learned humility for a second time that weekend. Justin won ten games to Jack’s one.